Baguette Design Mothers ring. 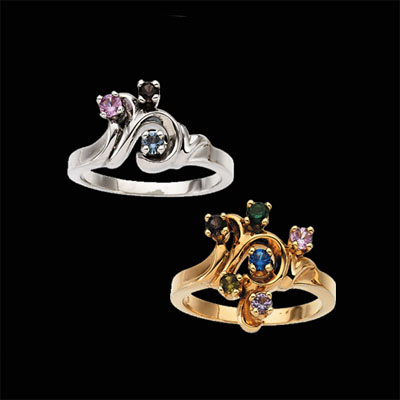 You'll love this stunning new mothers ring design available in 3, 4, or 5 gemstone selections all with diamond accents. 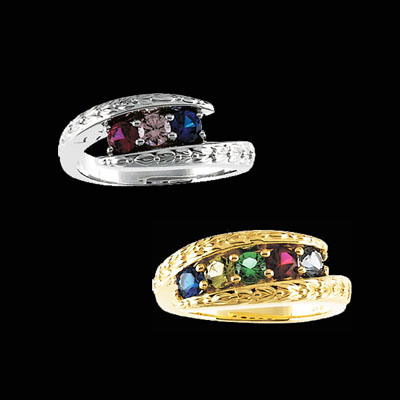 We offer this ring in 14k Yellow, or White gold, 18k Yellow or white gold, and Platinum options. The baguette gemstones measure 4x2mm. Simply email for a price quote on this ring. 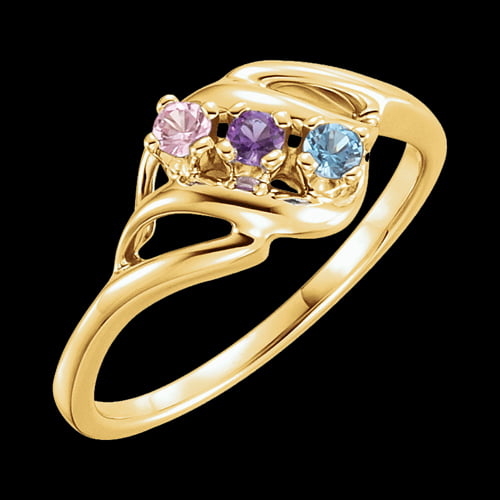 This ring is also very pretty as just a gemstone ring. Gold Mothers Ring. Beautiful 14k Yellow or White gold Mothers ring. 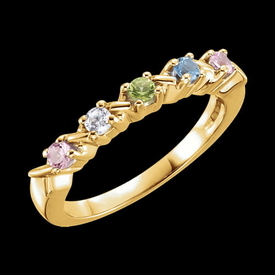 This delightful design is available with 1-6 gemstones genuine or synthetic. Each stone measures 2.5mm round. Mothers Ring. Pretty 14k Yellow or White gold Mothers ring. This ring will hold up to 5 gemstones. Each gem measures 2.2mm round. 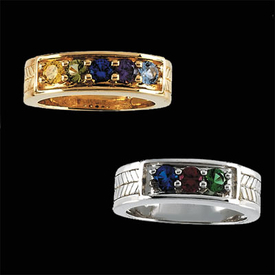 If you order this ring in the 1 stone version there may be additional pricing for the Diamond, Emerald, Ruby, Alexandrite, and Sapphire. The 1 stone version is set with a 3mm round stone rather then the 2.2mm on the ring set with more then 1 stone. Use our request for pricing with synthetic gemstones. Pretty Mothers Ring. 14k Yellow or White gold Mothers Ring. 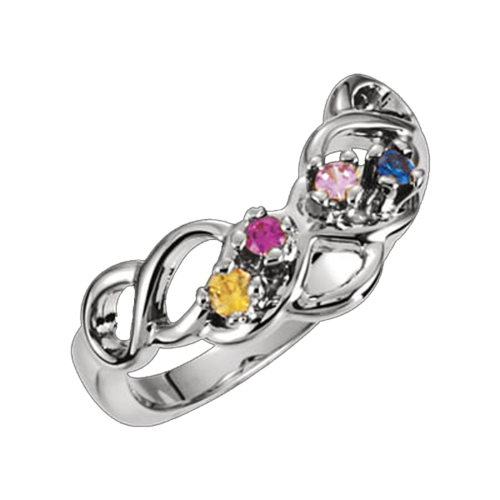 This unique swirl design birthstone ring will hold 1-4 gemstones, each measures 3mm round. Wonderful keepsake Mothers day gift. 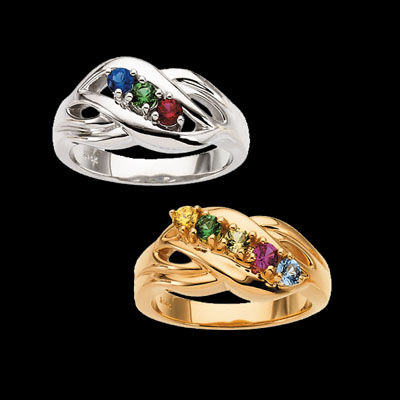 Prices increase for the gemstones and the amount of gold, the more stones the more gold. Gold Mothers Ring. Lovely swirl design 14k Yellow or White gold Mothers ring. 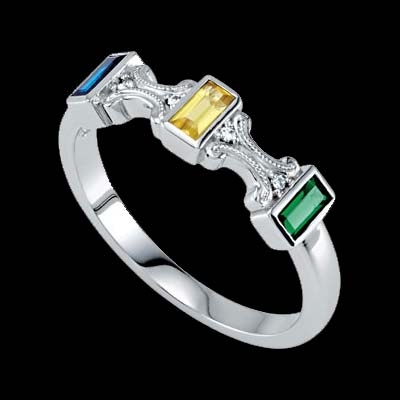 This ring is available in 1-6 genuine or synthetic gemstone selections. Gemstones measure 2.5mm round each. 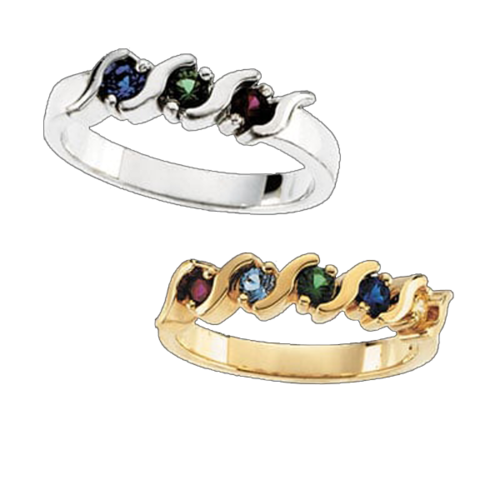 Gold Birthstone Mothers ring. Lovely 14k Yellow or White gold pass design Mothers ring. 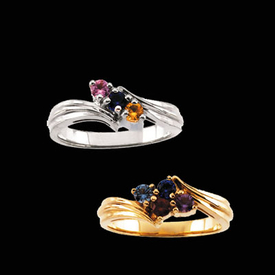 Ring can be set with 1-4 genuine or synthetic gemstones each measures 2.7mm round. Great keepsake gift for any mom. Lovely Mothers Ring. 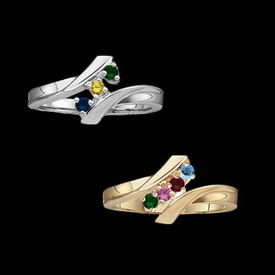 14k Yellow or White gold by pass design Mothers Ring is available set with 1-5 genuine or synthetic gemstones. Gemstones measure 2.7mm round. Great keepsake Mothers Day gift. 14k Gold Mothers Ring is available in 1-5 stone selections and 14k Yellow, Rose, or White gold. Use our request link for pricing with your gemstone selections. We'll email you a graph for gemstone placement. Wonderful personal gift idea. Genuine gemstones are listed yet we are happy to use lab created or simulated stones in there place, email for pricing. Pretty Mothers Ring. 14k Yellow or White gold lovely scalloped design edge Mothers Ring. This style is available set with 1-5 genuine or synthetic gemstones. Each stone is 3mm round. Great keepsake Mothers Day gift. Incredible Mothers Ring. 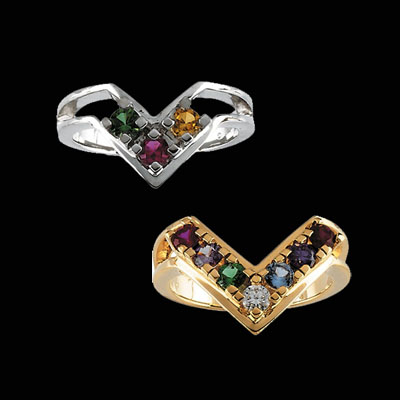 14k Yellow or White gold by pass design birthstone Mothers Ring will hold from 1-5 genuine or synthetic gemstones. Unique embossed leaf design gives this ring a style all it's own. Use our request for pricing, also available in Platinum. Fantastic Mothers Day gift idea. 14k Yellow or White gold chevron design Mothers birthstone ring. This unique "V" design family ring is available set with 1-7 gemstones. Also available in Platinum, email for pricing. Gemstones are each 3mm round. Wonderful Mothers Day keepsake gift idea. *Lab Alexandrite is Chatham Lab created. Fantastic 14k Yellow or White gold Mothers Ring. This beautiful ring may be set with 1-5 genuine or synthetic gemstones. Wonderful mothers day gift. Gorgeous 14k Yellow or White gold ring for Mother. By pass design is available set with 1 to 7 genuine or synthetic gemstones. Use our request for pricing. Price varies depending on gemstone selections. Genuine gemstones are listed yet we are happy to use lab created or simulated stones in there place, email for pricing. Mothers Ring, 14k yellow or white gold and Platinum available. This stackable design ring features an XO design perfect gift idea. Design will hold 1-5 simulated or genuine gemstones. Use our request link for pricing with your gemstone selections. 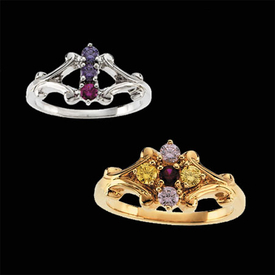 Price shown is for the ring set with 1 simulated stone. We'll email you a graph for gemstone placement. Beautiful Mothers Ring. 14k Yellow gold, 14k white gold, or Platinum. This mothers ring is available set with 1 to 7 simulated or genuine gemstones. Each gemstone is 2mm round. You'll love this by pass ring design. Use our request link for pricing with your gemstone selections. We'll email you a graph for gemstone placement. 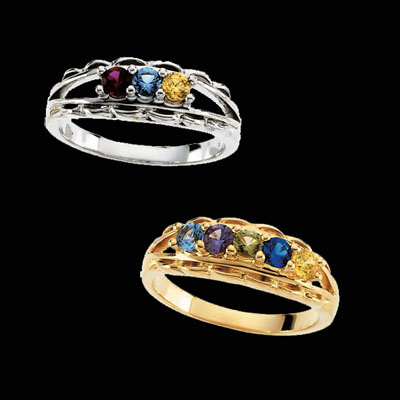 Birthstone family ring available in 14k Yellow or White gold. 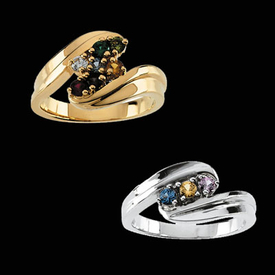 Ring will hold between 2 and 6 simulated or genuine gemstones. Use our request link for pricing with your gemstone selections. We'll email you a graph for gemstone placement. Fantastic personal gift idea. 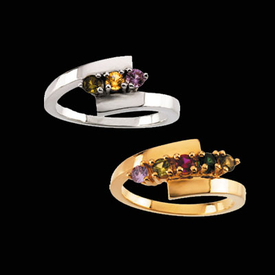 14k Yellow or White gold Mother Ring, also available in Platinum. 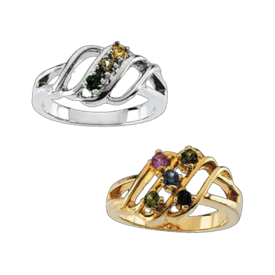 This shrimp design ring will hold up to 7 genuine or synthetic gemstones. Price shown is for the 2 stone ring. Use our request line for quick accurate pricing on your ring selection. Ring for Mother. Beautiful 14k Yellow or White gold, 18k gold, or Platinum birthstone Mothers ring. 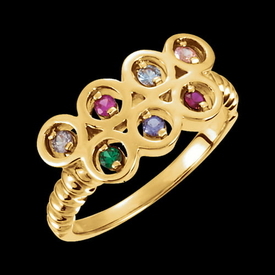 This ring is a very nice "S" design, each stone measures 2.4mm round. 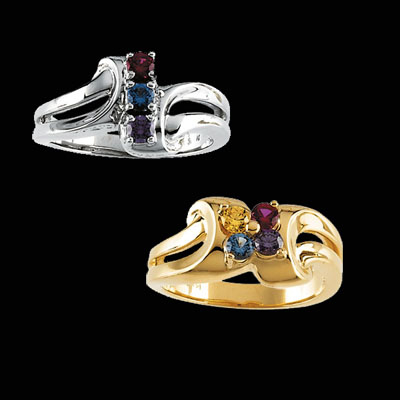 Price shown is for the ring ready for 2 stones, available up to 5 gemstone settings. Simply use our request for pricing with your genuine or synthetic stones. Beautiful 14k Yellow or White gold Mothers Ring. Personal and precious, this ring is a great gift idea. Set with large 3.5mm round gemstones genuine or simulated. Use our convenient request link for pricing with your gemstone selections. 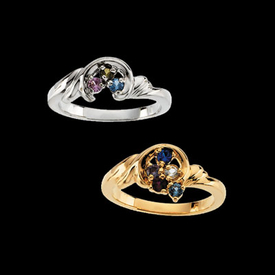 Ring will hold up to 5 gemstones. Will arrive in a velvet gift box. Genuine gemstones are listed yet we are happy to use lab created or simulated stones in there place, email for pricing.